Do you ever feel like pain is holding you back from enjoying life? Movelat provides effective, targeted pain relief to help you get back on your feet. 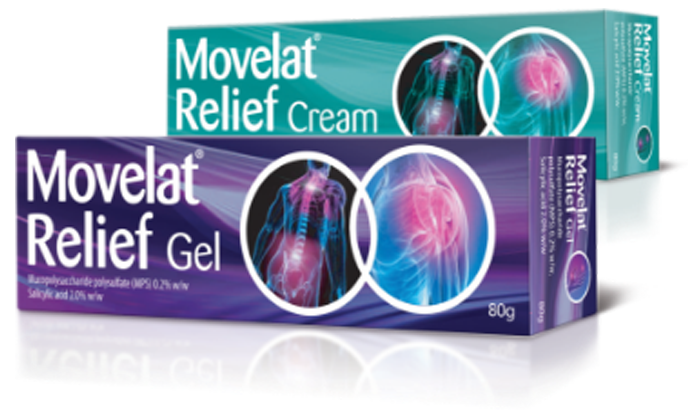 Movelat Relief Cream and Gel provide effective, targeted and clinically proven relief from local pain and inflammation caused by rheumatic and muscular pain, stiffness, sprains, strains and mild arthritic conditions. Unlike other topical pain relief treatments, Movelat can be used alone or in conjunction with oral NSAIDs. Movelat can keep you moving, helping ensure that aches, pains and non-serious arthritic conditions don’t hold you back from enjoying everyday life. Unlike cooling gels and heat patches that work by cooling or heating the skin, Movelat delivers a non-steroidal anti-inflammatory drug (NSAID) straight to the site of pain.